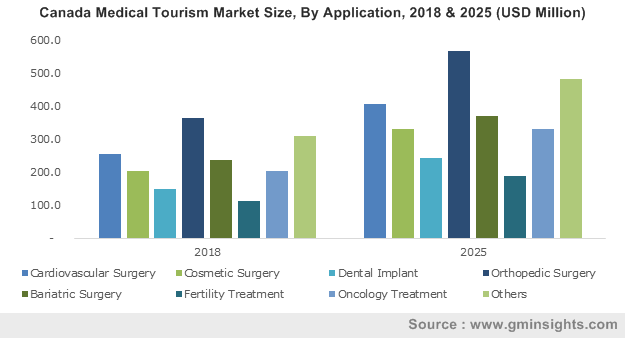 Medical Tourism Market size was valued at USD 17.3 billion in 2017 and is expected to witness more than 7.3% CAGR from 2018 to 2024. Growing awareness about medical tourism among patients will boost demand for medical tourism over the forecast period. Various public and private hospitals along with constant support and various initiative of respective government for promoting medical tourism will create awareness about medical tourism. For instance, Indian government is constantly marketing and promoting India as a global destination for affordable and high-quality healthcare system. As increasing number patients are being aware about safety and effectiveness of medical procedures in foreign countries, the demand for medical tourism is expected to increase in the future. Low cost of medical treatment in foreign countries is one of the major reasons for growth of medical tourism industry. Many patients from developed countries such as the U.S. and Canada fly abroad annually for accessing medical treatments at affordable and low cost. This is due to the fact that availing medical treatments in developed countries is much costlier as compared to developing countries. For instance, the pre-capita spending on healthcare services in U.S. is above USD 10,000. Also, patients save about 50-75% of the healthcare cost in developing countries without compromising quality and effectiveness of the procedure. Aforementioned factors will promote medical tourism throughout the forecast timeframe. Various government policies to ease medical travel will spur the market during the projected timeframe. For instance, government of India announced in May 2016 that it will issue electronic-visas to patients of about 150 countries including U.S., UK, UAE and other Asian countries for medical treatments in India. This initiative will further accentuate growth of medical tourism business in India. Also, Indian government is undertaking various measures to assure high-quality medical treatment for foreign patients. Favourable policies for ease of medical travel will boost medical tourism industry in the future. However, the absence of any organized medical tourism structure in developing countries will hamper growth of global market. Furthermore, long waiting time for availing several medical treatments and issue with patient follow-up and post-surgery complications will hinder medical tourism market growth. 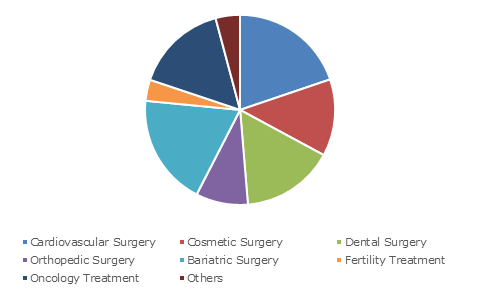 Cosmetic surgery market accounted for USD 2,863.1 million in 2017 due to increasing number of patients traveling to foreign countries to obtain cosmetic procedures. Increasing influence of aesthetic appeal is one of the major factors leading to growth of cosmetic surgery market. Also, international medical coverage is another major factor that will boost cosmetic surgery market. With availability of highly trained and qualified plastic surgeons in developing countries, the cosmetic surgery market will spur in the future. Orthopedic surgery market will expand at 8.1% CAGR during the forecast timeframe. As number of people suffering from osteoarthritis and osteoporosis is increasing, the demand for orthopedic surgery will increase in the future. Furthermore, patients save about 25-75% on orthopedic surgeries outside U.S. without compromising quality of the surgery. 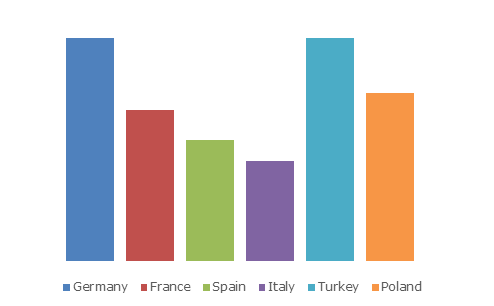 With increasing prevalence rate of osteoarthritis and rheumatoid arthritis in developed countries, the demand for orthopedic surgeries in foreign countries will increase in the future. Mexico market accounted for largest revenue of USD 2,217.6 million in Latin America in 2017. Large number of U.S. and Canadian citizens traveling to Mexico for availing medical treatments at low cost will be the major factor for Mexican growth. Moreover, the Mexican government has recently established medical tourism advisory board that will be responsible for formulation of policies supporting medical tourism growth. Also, extensive marketing and campaigns for promotion of Mexico medical tourism will attract large number of patients from developed countries. Indian market is forecasted to expand at the rate of 12.6% CAGR across the forecast timeframe. Growth is attributable to availability of high-quality medical procedures at low cost as compared to other developed countries. Also, various initiatives taken by the Indian government for promotion of Indian medical tourism will propel the industry significantly. For instance, the National Medical and Wellness Tourism Board of India is working with Ministry of Tourism for development of new medical tourism policy. Favorable government policies coupled with availability of high-quality medical procedures will favor industry growth. 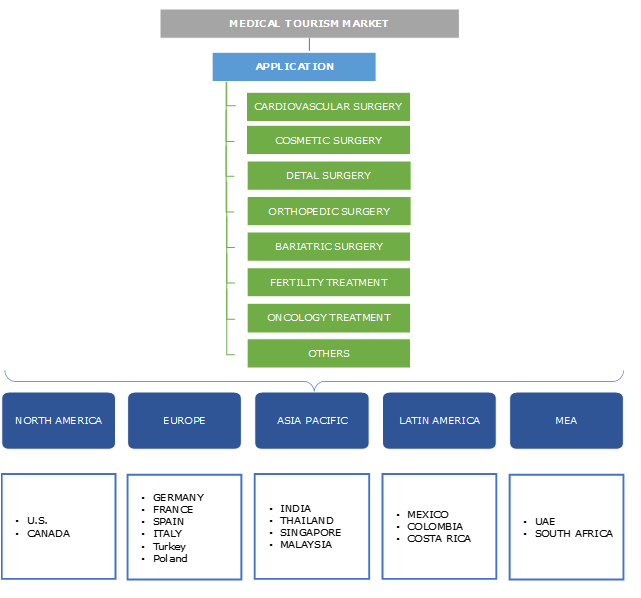 Few of the notable industry players operating in global medical tourism market are Apollo Hospitals Enterprise Limited, Asklepios Kliniken GmbH & Co. KGaA, Fortis Healthcare Limited and Bumrungrad International Hospital. These hospitals adopt strategies such as business expansion, marketing to foster business in medical tourism industry. For instance, in November 2015, Bumrungrad International Hospital announced establishment of clinic and diagnostic center in Myanmar in a joint venture with Yangon Medical Services. This establishment will enable Bumrungrad International Hospital to attract more Myanmar patients and spur revenue generation. Medical tourism can be dated back to 18th century when mostly wealthy people form developing countries travelled to Europe and U.S. for treatment purposes. However, the scenario started reversing in the late 20th century and rose significantly in the 21st century. Currently, developing countries in South Asia Pacific and Latin America region are the most common destinations for medical tourism. Countries such as India, Thailand, Mexico, Costa Rica attract majority of the foreign patients for treatment purposes. This is attributable to availability of advanced medical treatments similar to those in developed countries but at only 25-50% of the cost. The industry is expected to grow significantly over the next few years owing to increasing number of patients traveling to foreign countries for availing healthcare benefits at much economical rates. With growing promotion and awareness of medical travel among patients, the industry will witness tremendous growth in the future. However, policy makers and governing bodies in developing countries will have to regularize the structure of medical tourism sector and ensure complete safety of foreign patients.